Adequan Equine is recommended for the intramuscular treatment of non-infectious degenerative and/or traumatic joint dysfunction and associated lameness of the carpal and hock joints in horses. 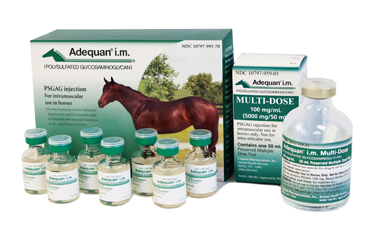 Adequan Equine I.M. 500mg/5ml 7 x 5ml Vials Box is recommended for the intramuscular treatment of non-infectious degenerative and/or traumatic joint dysfunction and associated lameness of the carpal and hock joints in horses. Package contains 7 Vials.